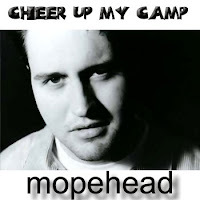 Much of the reason I went with the pseudonym mopehead was due to tracks like "Cheer Up My Camp". I have always been into recording sad acoustic songs. Often times I bum out my family because I am listening to something that they think is depressing (and I think is beautiful). There is nothing wrong with emotion and some of the best music ever has been recorded in deep, thoughtful and contemplative times. Take Drew Andrews (a member of The Album Leaf ) CD entitled "Only Mirrors". There is something magical about that disc. Yeah it is a bit sad, but in a good way. Lonesome music makes me feel at home. I watched The Curious Case of Benjamin Button over this past weekend. That totally bummed me out, but again, in a good way. Things that cause thought and emotion - that's good. Sometimes during the day to day rush we thrive on other types of emotions - anger, impatience or worry. Just seeing my wife or kids can bring me back to a place of comfort and happiness, but sometimes it takes a song to bring me back to what's truly important. mopehead songs are not intended to be perfect, but rather real and honest (or real honest). "Cheer Up My Camp" is unreleased (at least on CD), but was on a demo tape I was circulating (I think by buddy Jay might be the only person who still has his copy). When I hear tracks from this time period I get nostalgic - thinking about love that was and love that was lost. Every now and again I get a pang of pain and sadness, but I'm blessed now to have a wife and life I love more than loves I've lost and lives I could've had. However, from time to time, "the worst feeling in the world is the homesickness that comes over a man occasionally when he is at home." I feel this way...sometimes too often. I was in a bit of a funk over the Memorial Day weekend. Don't get me wrong, I had a nice weekend, but something just seemed off. It could have been that I was in deep thought about what Memorial Day means. When I was a kid my Dad would take me to Memorial Day services at a local military graveyard. He taught me to respect our Veterans and what they gave to ensure our way of life. He was in WWII, the Captain of a mine sweeper (Navy) and his job was to sweep the bays and waterways of the East Coast. He had some pretty harrowing stories to tell. His Navy experience was always with him. We'd go to Fleet Week (in SF) and tour the ships almost every year. I understand now that due to his rank we got tours that ordinary people would never get. He was very proud t o serve his Country and I am very grateful that he did. He instilled a love our Country in me that I hope to pass on to my kids. 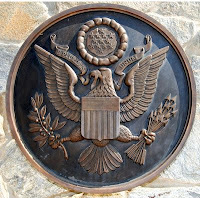 My Father is buried in the San Joaquin Valley National Cemetery.